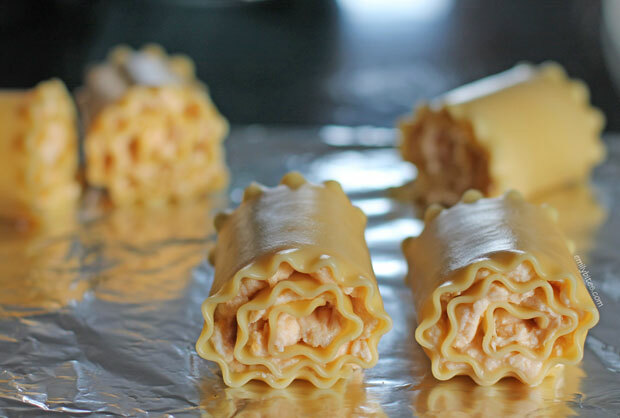 If Buffalo chicken, macaroni and cheese and lasagna all got together and somehow made a baby, I’m pretty sure it would be these Buffalo Chicken Lasagna Roll-Ups. They’ve got the uniquely spicy Buffalo flavor, a creamy, cheesy cheddar sauce and a chicken and ricotta mixture all rolled up into fun individual lasagna roll-ups. Ever since I made the Mexican Lasagna Roll-Ups I’ve been thinking about doing a Buffalo chicken version, and I’m really glad I finally did. Just add a salad or a side of veggies and you have a filling and complete meal with a cheesy, decadent main course you’d never guess was only 305 calories or 9 Weight Watchers SmartPoints. Don’t forget to check out my Easy Slow Cooker Shredded Chicken post- the perfect way to make shredded chicken for this recipe! Addicted to Buffalo chicken? As a Buffalo girl, I’m here to help! Try my Buffalo Chicken Enchiladas, Buffalo Chicken Quinoa Bake, Buffalo Chicken Pizza, Buffalo Wing Hummus, Buffalo Chicken Wonton Cupcakes, Buffalo Cheese Bread, Slow Cooker Buffalo Chicken, Buffalo Chicken Wraps and more! Emily this sounds delish! You are my hero with your delicious recipes. My son LOVES your french dip cups (he is sooooooo picky) and my daughter and husband love all your other recipes. You are a God send! These look amazing!!! Is it 8pp for 1 roll? Thanks, I hope you love them! This looks really good.. but 300 calories PER 1 roll up?? That’s a bit much, there’s no way I’d be full with just 1 roll up, and my husband would need at least 4 of these to be full. Good concept, but way too many calories for me. Sorry you feel that way! One was perfect for me and my husband was full with two. I have several other lasagna rolls on my site and they’ve always been popular! Also forgot to mention, a 1/2 cup of Hot sauce, I can’t even imagine how much sodium that is! I’d be bloated for two weeks after eating this. I usually love your recipes, but this one has missed the mark with me. Sounds like this isn’t the recipe for you, Cindy! Each serving would have one tablespoon of hot sauce. How do I save to recipe box? The second I saw these, I knew I had to make them (if the recipe contains buffalo chicken, chances are I want it in my life). Last night was the night! These were AMAZING! They are a bit point heavy, but I didn’t mind since I was full up with one serving. I used lowfat ricotta instead of fat-free and 9 oz. reduced fat shredded mexican cheese. If I were making this not WW-friendly, I would have used full fat cheese because it would have melted better in the sauce. Even so, this dish was amazing. I loved it and so did my non-WW boyfriend–he had 4 servings! Definitely a home run, Emily!! And Emily does it again! These are delicious and another husband pleaser! (He had 2.) I had one with a side salad and it was plenty! I couldn’t have eaten 2 if I wanted to! Thanks Emily! I’m so glad you and your husband found them filling and delicious, thanks for the report ;). I loved this, such a great dish. It was easy to make! Emily is there ever a proper substitute for ricotta? I just cannot stand to eat it and that typically causes problems when finding a good lasagna recipe. Do you think this would hold up without it? Has anyone frozen these? I am wondering how well they would do frozen and then reheated. 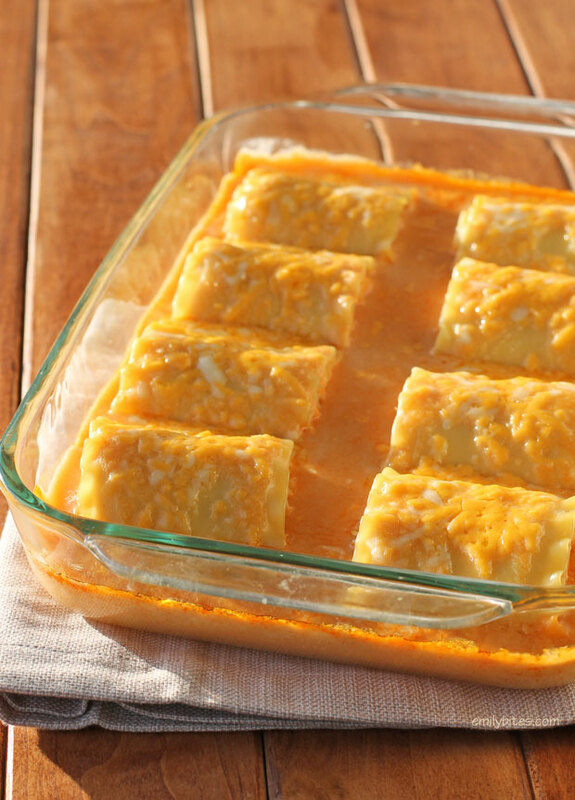 Making this now….I don’t have regular cheddar because it says in the ingredients they are both sharp cheddar. Darn. Hope it doesn’t ruin the recipe. It says regular cheddar in the directions but sharp cheddar in the ingredients. I’m sure it won’t matter , all cheese is good! It’s in the oven now. I’ll report back! Sorry I confused you, the “regular” referred to it being full-fat as opposed to the reduced fat cheddar. Both were sharp as stated in the directions, but any cheddar would be fine, sharp just tastes better :). These are absolute heaven. I made them for my sons (and their friends) and I had to make another batch they were soooo delish!! I saved one out for myself and I was completely full…no possible way I could have eaten another one or even half of another one!! Just the right amount of hot sauce too!! This recipe, at least for me and my crew, was spot on! Thank you!! LOVE this recipe! Flavors are just great and I really enjoyed it! I’m thinking the spicy cheese sauce could definitely be used in other ways as well!! These are baking in the oven right now. Tasted the sauce as I was cleaning dishes and oh man, SO GOOD! We love the Mexican Lasagna Roll-Ups so much, but I’m very glad we switched it up this time to try a different roll-up. Thank you so much for consistently providing delicious recipes! I’m planning to make these this week with your shredded buffalo chicken I had leftover and froze (BTW–that one freezes beautifully). I’m thinking I will donthebrecipe exact the same but cut a little of the hot sauce in the cheese sauce so it’s not too hot overall. I’ll have to recalculate PP but I don’t think it’ll be too different. Thanks for the recipe! I’m sure that’ll work great – hope you love it! Made this two nights ago. I really liked it. I also made the buffalo chicken taquitos. I really liked those too! My very picky husband likes both recipes as well which is amazing! Thank you! These look so good, but I don’t like ricotta cheese. I had seen in another comment that you could use cottage cheese instead, but would it still be the same amount (15 oz.)? I would keep the ounces of cheese the same. Since cottage cheese can be less firm than ricotta I sometimes mix it with some softened cream cheese if I’m using it in lasagna. I haven’t tried that in this particular recipe but I’m sure it would be good. Hope you like it! I made this recipe last week and it was a big hit! It was even better the next day when I heated it up for lunch. We especially liked the spicy sauce! I used a rotisserie chicken from the grocery store and it worked great. The only thing I will change next time is to increase the amount of chicken to 1 1/2 – 2 cups. Thanks for sharing this great recipe, it was a nice change from the ordinary. This was my first Emily Bites recipe and it was soooo good. I mean really good!! The hubby loved it too. I added some oregano to the ricotta cheese mixture but otherwise followed it exactly. I can’t wait to try other recipes on this blog! Thank you for sharing such yummy meals!! It’s a great tool to use to help me with my Weight Watchers plan. I’m so happy you loved it, let me know what you try next! This was SO YUMMY! My hubby was scared it would be too “vinegar-y” but he was happily surprised it was not. My sister-in-law even asked for the recipe and kept raving about it. I had a light lunch, so that was my excuse for eating 1 1/2 but with a larger portion of vegetables, I could have been quite happy with just one…but it was SO GOOD I wanted more! I look forward to trying more of your recipes, and I appreciate your including the nutritional information. I can’t wait to make this again for other friends/family! Thank you! These were AMAZING! One was plenty for all 4 of adults I made it for, in fact I ate 1 and a half and felt full! everyone raved about it!! I have tried so many of your recipes now but this one. WOW! I’m in love! I had to use low fat ricotta instead of fat free so my calories are a bit higher but I can live with that! I’ll be making this one again and again for sure. I’m so happy you loved it, Angela!